A.E. 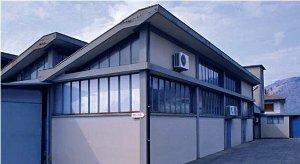 Coltellerie is an Italian specialist company that has been working for over three generations in the most common industrial sector in the Maniago area (Pordenone) which has been producing blades, knives and other cutting instruments since medieval times. The present range of clasp knives includes a variety of blades for use in agriculture (bill hooked and grafting knives), fishing, sailing and industry (electricians’ knives) and has recently expanded to also provide a specially designed series of models known as Antonini SOS for use in rescue situations (already in use by special Fire Brigade, Civil Defence and Red Cross corps). Our knives are assembled, finished and sharpened all by hand. Since 1925 we stand behind our work and are proud to offer a lifetime warranty covering all craftsmanship and hardware we use in the construction of our cutting tools. Remember! Our items are working tools. Never use them aggressively or as a weapon!